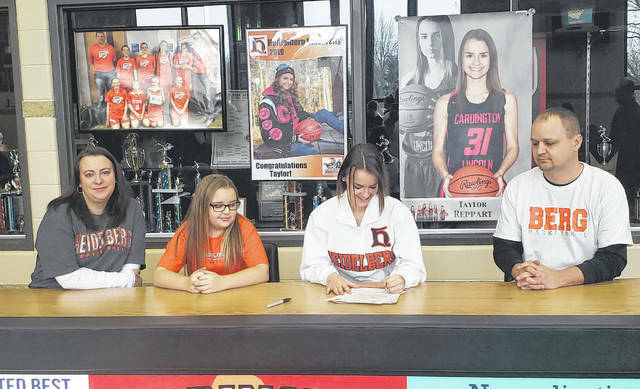 Cardington’s Taylor Reppart signs to play basketball for Heidelberg University. With her in the picture are her parents, Jennifer (l) and Lyle, as well as her younger sister, McKale. Cardington girls’ basketball player Taylor Reppart will continue competing in that sport after graduating high school. The Pirate senior signed a letter of intent to play for Heidelberg University last Thursday. She noted that it didn’t take long to decide upon Heidelberg after first visiting it. Reppart added that she also liked the small size of the university, feeling that smaller classes would lead to better opportunities while studying in her planned major of pre-veterinary studies. She noted that the team’s coaches also are very involved with their athletes’ academic progress. Reppart said that playing college basketball wasn’t really something she’d really thought about until fairly recently. Reppart added that the Heidelberg coaches liked a lot of aspects of her game. Being able to improve on her game is one of the things she is looking forward to most about the college game. “Working on my strength and ability is what I’m most looking forward to because I know I have room to improve at what I love doing,” she said. Before going to Heidelberg, though, Reppart will have to finish her senior year with Cardington, making her announcement a bit bittersweet, as she said that she’ll miss her current team.